The central office buildings in this section are located in what was known as the Atlanta Exchange in 1975. This does not include the entire Metro Atlanta free calling area. Prior to Extended Area Service, which was introduced in 1960, the area covered by these offices made up the local calling area for Atlanta. At that time, the Atlanta offices had codes that started with digits other than "4" and "9". The outer offices that made up the extended calling area started with "4" or "9". When Area Code 404 was split in 1995, these offices remained in 404, while the outer offices became 770. Most of these offices are still in existence in 2002. There are audio recordings of many of the ringing and busy signals from these offices. They may sound rather repetitive but there were subtle differences between many of them and very noticable differences between others. There was certainly more variety than we have today. Construction of the first part of the building began in 1908. The building was initially known as the "Ivy Building". The second half of the building was started in 1921 and completed in 1923 for the Walnut dial office. The entire building was then called the "Ivy-Walnut Building"
Over the next few years, some business customers in the Ivy office were changed to Walnut to take advantage of dial service. A third office name "Official" was created for Southern Bell Offices. The main number for Southern Bell was Official-8800. In 1928, the second Panel machine was installed and the Main office, previously served out of the Pryor Street building became a dial office. In 1930, the Ivy Office was still a manual office and was renamed "Jackson". There was another office name, "Huntley" that was also changed to Jackson. We are not sure about where that name came from. In 1934, a Step-by-Step machine was installed in the building and entered service as the new "Cypress" office. The Step-by-Step machine was expanded further in 1946, adding the "Lamar" office. All of the private line customers in the Jackson manual office were reassigned to the Lamar dial office, keeping the same last four digits. In fact their telephone numbers didn't really change since the first two letters of Lamar coincided with the same dial digits as the first two letters of Jackson. Party line customers on the Jackson manual office remained on the manual office, which was renamed "Alpine". In 1949, the Step-by-Step machine was expanded further and on January 23rd, took over the last manual office, Alpine. All of the customers in the Alpine manual office were party line customers with telephone numbers ending in a party letter. The customers were all reassigned new telephone numbers to eliminate the party letters, but the new numbers remained on Alpine. On June 5 of the same year, the two Panel offices got a new, higher pitched dial tone. It could be that this made them the same as the Step offices. 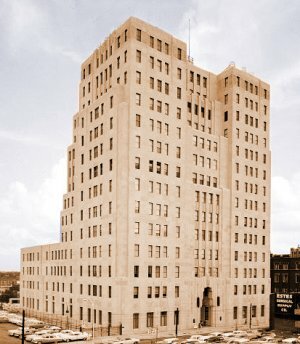 At this point, there were two Panel offices, Walnut and Main, and three Step-by-Step offices, Cypress, Lamar, and Alpine. There was an "Official" office name too, but this was just for the telephone company offices. On November 18, 1956, the Walnut Panel machine was retired. Customers with Walnut numbers were moved to new crossbar machines in the 51 Ivy Building. Walnut 0001-2499 numbers became Jackson-1. Walnut 2500-9999 numbers became Jackson-2. For the next four years, the remaining Panel machine, now with the code Murray-8, remained in service. We are not sure how the code Murray-5 was handled. For the new No. 5 Crossbar offices to connect with this office, they would have either had to have Revertive Pulse senders and registers or they would have used dial pulse. On September 24th,1960, the second Panel machine was retired. Murray-8 numbers were moved to one of the crossbar machines in the 51 Ivy Building, no change of numbers occurred. Coinciding with the removal of the Murray-8 panel office, the telephone business office which was MU5-8600 was changed to 529-8600. This number terminated in a manual switchboard. Starting in the 1960s, when Extended Area Service was introduced, Step-by-Step equipment in the building was added to be used for tandem switching. This began to be referred to as the Auburn Avenue Step Tandem. This tandem was used by intown Step offices to complete calls to outer suburban offices. All of the outer offices had codes starting with "4" or "9". For example, when customers in the "87" office dialed "451", the initial "4" connected them to the Auburn Avenue Step Tandem, the second digit "5" connected them to Chamblee. This kept the other Step offices from all having to have trunks to the outlying offices. This tandem was used into the 1970s by Step offices at Auburn Avenue, West End, and Tenth Street. Other offices may have used this tandem at one time or another. Most were switched to the Decatur Crossbar Tandem when it was placed in service in 1964. In 1964, Centrex CU Service was set up for three banks using the 588 prefix. C&S Bank had numbers 588-2xxx and 3xxx. First National Bank had 588-5xxx and 6xxx. Trust Company Bank had 588-7xxx. And in 1965 a similar setup was created for the Federal Government using the 526 code. At this point, the building served prefixes 523, 524, 525, 526, 529, and 588. The 529 code was used for telephone company executive offices. This was basically a Centrex setup. It is uncertain whether the step-by-step equipment associated with this code was in the Auburn Avenue building or in the 51 Ivy building. The reason for the doubt is that the tone plant for 529 sounded completely different than the Auburn Avenue step. The ringing tone sounded like one of the smaller ringing machines used in the crossbar offices installed between 1962 and 1968. If the equipment were in the Auburn Avenue building, it should have sounded just like the other codes in that building. 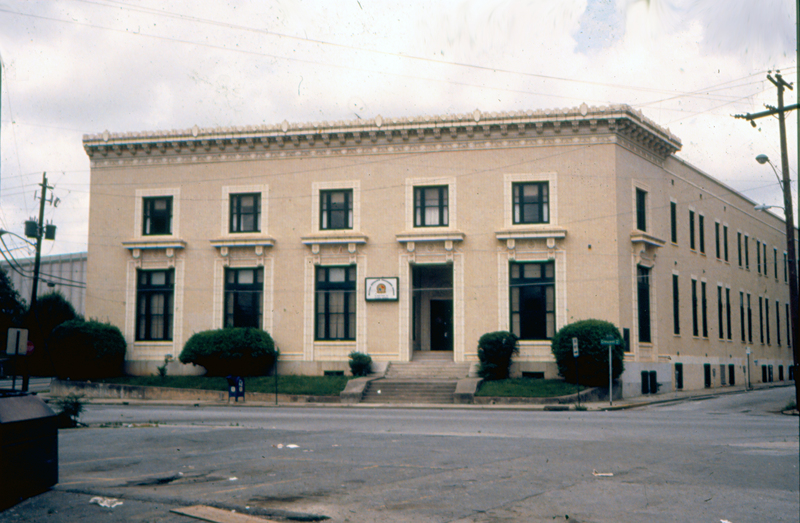 Around 1968, Trust Company Bank made an agreement with Southern Bell to purchase the land at this site in exchange for the property at the corner of Courtland Street and Auburn Avenue; the site of the current Courtland Street C/O. 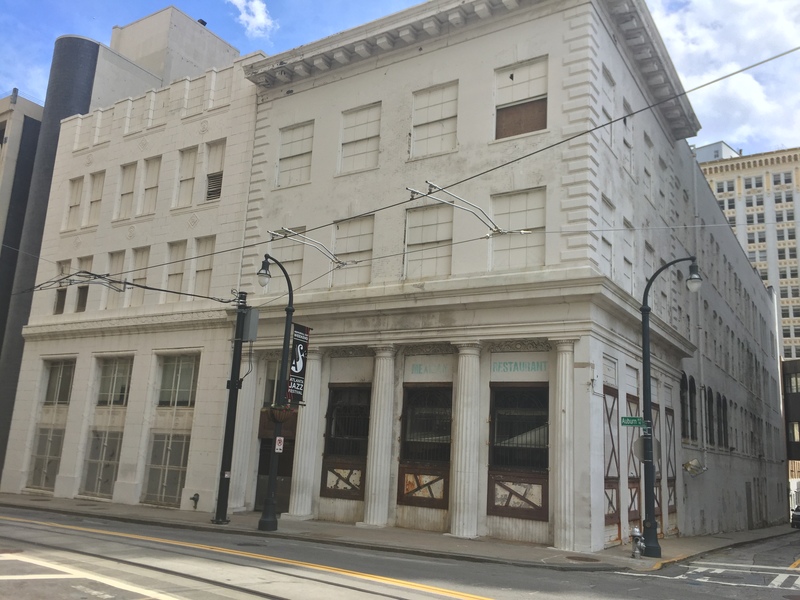 Southern Bell then leased the 25 Auburn Avenue property back from Trust Company, with the intention of moving out of the building. Trust Company wanted to build another tower to match their existing one next door. This plan was apparently abandoned since Southern Bell stayed in the building for about 10 more years and the building sat vacant for at least 25 years after that. In September, 1977, all customers were cut over to a new ESS machine in the Courtland Street Building and this building ceased operation as a switching facility. On the same night, the West-End office and the Stone Mountain office were cut over to new ESS machines. This is a beautiful Art Deco Style building similar to those built in New York and Chicago during this period. Over its lifetime, it has contained the most interesting array of equipment in the city. Construction started in 1929. The building was originally designed to have 21 floors. But it was only built with 6 floors. When the building opened in 1930, several newspaper articles were written about its technologically advanced features and environmental features. The initial purpose of the building was to house a new Toll Board for Atlanta. Atlanta had become an important toll center for the Southeast and Long Distance traffic was increasing. The building also housed offices of Southern Bell and AT&T. The six floors of this building were ..
2nd Floor Southern Bell Telephone & Telegraph Co. In 1948, the building was expanded to 14 floors. New Long Distance operator positions were installed on the 7th floor. The expansion opened in October of 1949 with an Open House for the press and the public. In 1951, the 4A Toll switch was placed into service. It was actually designated as A4A because it did not yet have the Card Translators. These were added later, turning the machine into a full fledged 4A. Operator Toll Dialing began following the introduction of this machine. In 1955, No. 5 Crossbar central office equipment was being installed for the cutover in 1956 of customers from the original Walnut Panel office. Two Number 5 Crossbar Machines (marker groups) were placed in service on the same day. The first machine (Marker Group 1) was opened serving the new Jackson-1 Office. The second machine (Marker Group 2) was opened serving the new Jackson-2 Office. Customers with Walnut numbers that had been served out of the panel machine in the Auburn Avenue building were moved to the new crossbar machines here and given Jackson numbers. Walnut numbers 0001-2499 became Jackson-1. Walnut numbers 2500-9999 became Jackson-2 numbers. In 1958, a 4 floor expansion was started. In 1959, a Crossbar Tandem switching machine was installed to provide Centralized Automatic Message Accounting (CAMA) when DDD service began in 1960. In 1960, the No. 5 crossbar machine serving the Jackson-1 code was expanded and took over the Murray-8 office previously served out of the Auburn Avenue building. The first No. 5 Crossbar machine now served 521 (JA-1) and 688 (MU-8). The second No. 5 Crossbar machine now served 522 (JA-2). In 1961, in the 521 code, only numbers 0xxx to 3xxx were assigned. These would have been the original customers from the 1956 cutover of Walnut. The 522 code had numbers assigned in all thousands groups. In 1963, the 681 code appeared. There was only one 681 number listed: "681-2611" belonged to Rich's Inc. This was very strange, because for many years, the 681 prefix was interchangeable with 521. You could dial any 521 number by substituting 681 and visa-versa. But even in 1965, only this single 681 number for Rich's was listed. Also in 1963, a microwave tower was added to top of the building. This sort of clashed with the Art Deco architecture. In 1964, a 10 story addition to the rear of the building was started. A year later, in 1965, a third No. 5 Crossbar marker group was placed in service serving the new 577 and 572 codes. The 572 code was primarily used to provide Centrex CU service to Fulton National Bank. 577 was provided for general use. In 1971, the 4A machine was upgraded to the electronic translator system (ETS). This modification relabeled it 4A-ETS. By this time, training facilities had been installed to train cordboard operators on new TSPS equipment in advance of its installation. Interestingly, when TSPS was first introduced, the switching equipment was installed at Rockdale rather than on the Atlanta 4A in this building. TSPS operators were located in the suburbs rather than in this building where the cordboard operators had been. Following the introduction of TSPS, after most CAMA traffic had been switched over to TSPS and the Atlanta Crossbar Tandem was not being used, the tandem was repurposed as a local tandem to take some of the load from the Decatur Crossbar Tandem. In 1976, a No 4 ESS digital toll switching machine entered service and the 4A crossbar machine was retired. The ETS processor from the Atlanta 4A, however, remained in service for many years as a part of the SS7 signaling network. On September 13, 1981, most of the crossbar equipment was retired when customers were moved to two ESS machines in the Courtland Street building. 572, 577, and 681 went to ESS Unit #1 which previously served 65x numbers. 521, 522, and 688 went to ESS Unit #2 which previously served 523, 524 and 525. The crossbar machine serving the 527 code remained in service a while longer. The 527 code was not dialable as a local call. It was used as a special code for WATS lines and TWX service. It could be that this code was handled by the second Crossbar 5 marker group that handled the 522 code. That marker group appeared to be underutilized if you considered only the 522 code. All of the other machines had multiple codes and more than 10,000 subscriber lines. In 1983, as a part of divestiture, this building became the property of AT&T. This building is located immediately behind the 51 Ivy building. Contrasting with the architecture of that building, this one is a windowless concrete cube. Similar designs were common during the period when this was built. The building has undergone several additions since its original construction. On November 24, 1970, the building opened with a No. 1 ESS switching machine serving the 656, 658, and 659 codes. The 656 code provided Centrex Service for the State of Georgia government offices. And 658 provided Centrex for Georgia State University and the Atlanta Police Department. The 659 code was used for general service. When the office was placed into service, the centrex service replaced a number of PBXs at the State of Georgia, GSU, and the Police department. At the same time, a portion of the downtown business district from the Courtland Street Central Office south to the state Capital was separated from the main downtown central office area and assigned to the Courtland office. All customers in this area were assigned 659 numbers. Around 1975, the separate geographical areas created in 1970 for the Courtland office and the other two offices were merged into a single area, making 65X numbers interchangable with 52X, 58X, 57X, and 68X numbers. In September of 1977, a second 1-ESS machine (Unit # 2) began service and step-by-step customers from the Auburn Avenue building were cut over to the ESS equipment. Prefixes were 523, 524, and 525. At some point in the 1970s, all No. 1 ESS machines were converted to No. 1A ESS machines by replacing the processor and other equipment. On September 13, 1981, most of the crossbar equipment in 51 Ivy was retired. Customers were moved to the two existing ESS machines in this Courtland Street building. 572, 577, and 681 went to ESS Unit #1. 521, 522, and 688 went to ESS Unit #2. Around 1983, a DMS-100 digital machine was installed. The State of Georgia Centrex was moved to this new machine. And a few years later, the code was changed from 656 to 653. At some point in the 1990s, a No. 5 ESS digital machine was installed and replaced both of the 1A ESS machines. 215, 221, 222, 223, 225, 230, 420, 506, 521, 522, 523, 524, 525, 526, 527, 529, 547, 562, 572, 577, 581, 582, 584, 586, 588, 589, 614, 653, 658, 659, 681, 688, 827, 878, 880. This building was for many years known as the Hemlock Building after the first central office opened here. Then when the Hemlock manual office was closed in 1951, the name evolved over the years. It was called various names. Some people called it Brookwood. Others called it Trinity after the name of the Step office from 1956 to 1961. The official name used by the telephone company was Tenth Street. On August 17, 1917, the building opened as a manual central office. The office name was Hemlock. This would have been a common battery switchboard, possibly one of the more advanced versions with automatic ringing. Some people believe that the Vernon office may have been a Panel office and was later replaced with Step-by-Step. But there is no evidence of this. In 1931, following a building addition and the installation of Step-by-Step equipment, the Vernon dial office opened. This was the city's first Step-by-Step office. Previous dial offices to this point had been Panel. The Hemlock manual office remained in service. Sometime between 1932 and 1944, the Atwood dial office was opened. On March 1, 1949, the Emerson Step office opened. And in June of 1951, the Elgin Step office opened, replacing the Hemlock manual office. In 1961, another code was added. At this point, office names were no longer being used, but letters were. So the new code was "TR-3" (873). In 1962, the 877 code was added, providing Centrex CO service for the telephone company's administrative offices. This is the only case in Atlanta where Centrex CO was provided on Step-by-Step equipment. It was usually provided by No. 5 Crossbar. This building now served 872, 873, 874, 875, 876, and 877. On November 19th, 1967, a portion of the geographic area was cut over to the new ESS office across the street on Peachtree Place. Around 3500 affected customers got new 892 numbers. All coin phones remained served out of the Crescent Avenue office. Southern Bell was very strict about preserving this geographical separation even though the buildings were across the street from each other. Customers in the Tenth Street office territory with 87 numbers could not get an 892 number in order to have Touch Tone and Custom Calling features. This was unusual. In other parts of town, if you were served out of a Step office and wanted Touch Tone bad enough, you could pay the mileage charge and get <EM>Foreign CO</EM> service and be served out of another office where Touch Tone was available. But here, ordering Foreign CO service to get an 892 number would have created a mileage charge of zero since the buildings were a block apart. At some point in the 1970s, the two geographic territories were merged once again and Tenth Street 87X numbers were interchangable with Peachtree Place 89X numbers. In late summer of 1979, all Tenth Street customers were cut over to ESS switching equipment in the Peachtree Place Building. The old step equipment in the Crescent Avenue building was retired. The building remained empty for several years before being torn down. The sound samples illustrate one of the unique features of the Tenth Street Step-by-Step office. There were two different tone plants. It appears that the first tone plant was used for codes 872, 874, and 876 (even numbers). The second one was used for 873, 875, and 877. On November 19, 1967 the Office opened as "892". This was the first ESS in the city. A portion of the territory previously served by the Crescent Avenue office was assigned to this office and all affected customers' telephone numbers were changed to 892. This area included the business district along Peachtree Street from Tenth Street to Pershing Point and the Ansley Park residential area. For some reason, this first ESS office did not have coin capability. Coin telephones in the area continued to be served by the Crescent Avenue step office. Technically this meant all of the coin phones were handled as FCO service. Around 1971, records show the original ESS machine being replaced with a new machine. The reason for this is unknown. But the new machine had coin control capability. After the change, coin phones in the serving area were assigned 892 numbers and served out of the ESS. In 1972, the 894 and 897 codes were added. These codes provided Centrex service to The Coca-Cola Company and the Georgia Institute of Technology. A few years later, a second ESS machine began service with the 881 code. This may have been the original 1967 machine, upgraded to new specifications and possibly including a 1A processor. In 1979, all of the 87x customers served out of the Crescent Avenue step office were cut over to the two ESS machines in this building. In 1982, the 885 code was added to ESS unit #2 and in 1985, the 888 code was added. In the late 1980s, a DMS-100 digital switch was installed. The 1A ESS equipment remained in service. In 1905, the office opened at 174 Ashby Street and was called "West". In 1922, the office name became Raymond. In 1931, a new building was constructed at the present day location and the step-by-step dial office was opened. All Raymond customers were converted to dial service. The street name was probably Gordon Street before becoming M.L.K. Drive. Some time between 1935 and 1944, a second office AMherst was added. In 1948, the FRanklin office was added. In 1955, as part of the city-wide conversion to 7 digit dialing.. In 1960, the building now served 753, 755, and 758. In 1965, the 752 code was added. In 1977, a No. 1A ESS machine was installed and all customers were switched to the ESS. On the same night, Auburn Avenue and Stone Mountain offices were cut over to new ESS machines. Prior to the installation of this office, customers would have been served out of the Hollywood Drive, Crescent Avenue, and Buckhead offices. The office opened in 1962 with the 355 code using No. 5 Crossbar equipment. In 1964, the 351 code was added. Some time between 1968 and 1968, a third code 352 was added. Around January of 1981 the crossbar equipment was replaced with No. 1A ESS. In December of 1999, the 1A-ESS switch was replaced by a 5-ESS. The Woodland office had a quirk that was found in some central offices around the country. The power supply in the building created a unique sound that could be heard at various times while placing calls. In this case it was a high pitched whine. The recordings below are from around 1977. Prior to the opening of this office, customers would have had Hemlock numbers. In 1931, the step-by-step office opened as "CHerokee". In 1948, the "EXchange" office was added. In 1956, during the conversion to 7 digit dialing, Cherokee became Cedar 3 and Exchange became Cedar 7. In 1961 or before, the 231 code was added. In 1961, 231 numbers were 1xxx, 2xxx, 3xxx, and 9xxx. In around 1964, a No. 5 Crossbar machine was installed and opened with the 261 code. The step equipment remained in service. In 1966, 231 Numbers and 261 numbers existed in overlapping thousands groups. 231 had 1000 to 5999 and 9000-9999. 261 had numbers in all thousands groups. But there were no conflicting numbers between the two prefixes shown in the numerical telephone directory. There was apparently a plan to merge the two. On November 19th, 1967, all 231 numbers were changed to 261, moving them to the crossbar switch. The newspaper reported that there were around 1800 customers changed. 233 and 237 remained on the step equipment. The same year, the 266 code was added to the crossbar machine. Around 1968, an ESS-101 PBX was installed for the Western Electric offices on Roswell Road and arranged for DID service on the 266 code. Based on the location of the Western Electric Offices, the serving central office should have been the Sandy Springs office, not the Buckhead office. Sandy Springs was also a No. 5 Crossbar and could have been used. At some point the audible ring tone in the Step office changed. For a period of time, calls from the step office to extended area numbers beginning with "4" and "9" were tandem switched through the No. 5 Crossbar machine in the same building. Some time around 1970, Touch Tone converters were installed in the step office. The type of converters used were compatible with the equipment used in the Chamblee common control step. The Buckhead step could have been upgraded to full common control if needed. Around 1974, the 262 code was added to the crossbar machine. Around 1975, a third floor addition was completed and a 1A-ESS machine began operation serving the new 231 code. The crossbar and Step equipment remained in service. At some time after this, the 233 and 237 customers were moved to the ESS equipment and the step equipment was retired. Later, the 26 customers were moved to the ESS equipment and the crossbar equipment was retired as well. Some time in the late 1980s or 1990s, a DMS-100 machine was installed and assigned the 816 code. This higher pitched tone was associated with No. 5 Crossbar machines that were installed from around 1967 to 1972. The Buckhead 26 office was the only office in-town office that had this tone. The Sandy Springs office opened in 1957 as "Blackburn-5". Equipment was No. 5 Crossbar. Prior to the installation of this office, customers in this area would have been served out of the Buckhead office. The office is called Sandy Springs but the building is actually 3 miles south of the Sandy Springs community. The building would have been more aptly named North Buckhead. As of 1960, Blackburn-5 became "255". In 1963, the 252 code was added. In 1966, the Sandy Springs office became the very first central office in Atlanta to have Touch Tone Service. In 1976, the 256 code was added. Around February of 1980, the crossbar equipment was replaced with No. 1A ESS equipment. The 257 code was added in 1982, followed by 843 in 1983, and 850 in 1985. On November 1, 1997, the No. 1A ESS equipment was replaced with No. 5 ESS digital equipment. 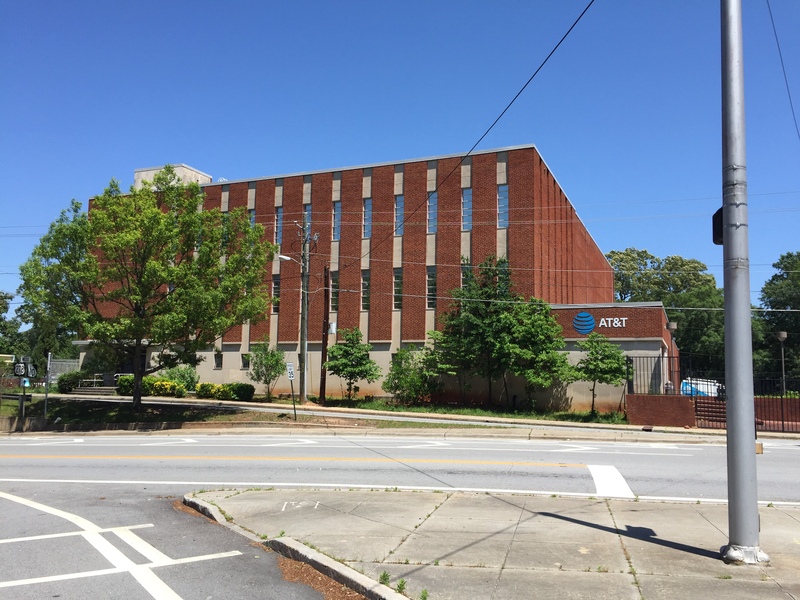 Prior to the opening of this office, customers in this area would have been served out of the Crescent Avenue Office, Buckhead Office, Chamblee Office, or Decatur Office. Construction started in June of 1954. The office opened in 1955 during the city's conversion to 7 digit dialing, cutting over customers from other area offices. The office was initially known as Melrose, with the codes "Melrose-4" and "Melrose-6". It was unusual to open a new office with two codes. This implies that there were over 10,000 customers assigned to this office in the first year. This was the last step-by-step office installed in Atlanta. And based on the year, it was strange that it wasn't a No. 5 Crossbar office. In 1960, the office name was officially dropped and the codes became 634 and 636. The 633 code was added in 1964. In 1969, another code was needed. The 631 code was assigned as a temporary measure. At this point, there must not have been any other available codes. All other "63" codes must have been in use elsewhere in Area Code 404. 631 was not ideal because of the arrangement of the step-by-step selectors. In this office, the first digit "6" connected you to a second selector, the "6" selector. The second digit "3" was absorbed (ignored) by the selector. So "634" was equivalent to "64", "636" was equivalent to "66", and "631" was equivalent to "61". The code "61" was being routed to the Test Selector. The Test Selector provided access to Repair Service and other test circuits. To add the new "631" code, they used the unused selector levels "3", "4", "5", and "0" on the Test Selector to create "631-3XXX", "631-4XXX", "631-5XXX", and "631-0XXX". This meant that dialing "631-1111" would route you to "611", "631-9111" would be treated as "6191", putting you into a party-line ringback circuit which would ring your phone when you hung up. This was only an issue with calls placed from within the Toco Hills office and not for incoming calls from other offices. The absorbing of the second digit on intraoffice calls eliminated the need for a third selector and was standard practice in the No. 1 Step-by-Step offices in Atlanta. For most of the 1960s, calls from the Toco Hills office to extended area offices beginning with "4" and "9" were routed via the Decatur Crossbar Tandem. This caused calls to take a less direct route to nearby offices like Chamblee and Tucker. In 1972, a second floor was added to the building and a No. 1A ESS machine was installed. The look of the building changed completely from an unobtrusive one story red brick building into a giant, ugly yellow brick and concrete cube. The new ESS machine began service with the "325" code. Almost immediately, all "631" customers were given new "325" numbers, eliminating the problems with the "631" code. After the ESS machine was installed, the EAS calls to "4" and "9" offices from the Toco Hills step office began to be tandem switched by the ESS machine. This provided direct trunks from the building to Chamblee, Tucker, and other places. Over the next several years, the 321 code was added, then the 329 code was added. The 329 code was partially used to provide <EM>Centrex</EM> service to Emory University and Emory Hospital. In March of 1980, the Step-by-Step equipment was retired and all "63" numbers were moved to the ESS machine. The Toco Hills Step-by-Step office was never equipped for Touch Tone service. Starting in 1972, when the "325" ESS office began service, Customers with "63" numbers had the option of changing to a "325" number to get Touch Tone or Custom Calling Services. Otherwise, they had to wait until 1980. In the late 1990s, the No. 1A ESS machine was replaced with a No. 5 ESS digital machine. The office opened some time between 1902 and 1905. Service was manual, probably using a common battery switchboard. The office at this point was simply known as East Point. In 1923, the office name was changed to "FAirfax" in preparation for dial service in other parts of the city. This office remained manual. In 1931, the office was converted to dial service using Step-by-Step equipment. Customers were given new telephone numbers and the office name became "CAlhoun". In 1948, the name "FAirfax" was reintroduced as a second code in the East Point dial office. In 1954, a building addition was completed and additional Step-by-Step equipment was added. In 1955, as a part of the city-wide conversion to 7-digit dialing, "CAlhoun" was changed to "POplar-1", "FAirfax" was changed to "POplar-7", and a new code "POplar-6" was added. In 1957, the newspaper reported that 69 long distance operator positions would be installed in this building. This may have been inaccurate since we have no other evidence that a Toll board existed in this building or any mention of it being removed at a later date. In 1958, the newspaper reported that the dial tone and busy signals were changed. In 1960, for a short time, office names were dropped, but the initial two letters were retained. This created codes "PO-1", "PO-6", and "PO-7". Shortly after that, the letters were dropped also and the codes were 761, 766, and 767. In 1963 the 762 code was added. This code was used, at least partly, to provide <EM>DID</EM> service for Delta Airlines and Eastern Airlines. The 763 code was added around 1971. In 1972, following a building addition, a No. 1A ESS machine began service with the code "768". Around 1980, all Step-by-Step customers were switch to the ESS machine and the Step-by-Step equipment was retired. At some point around this time, another code "765" was added for Delta Airlines. The No. 1A ESS equipment was retired in 1999 when it was replaced with No. 5 ESS digital equipment. The office opened on May 3, 1949. The equipment was Step-by-Step. The original office name chosen was "FIlmore". But the residents objected to the name since it was the name of a famous Yankee officer. So the name was changed to "DIxie". The letters "FI" and "DI" both represented the same two digits on the dial, so no equipment changes were required. In 1956, during the city-wide conversion to 7-digit dialing, the office name was changed to "MArket-7". In 1960, the office name was dropped and the code "627" was used. Sometime between 1962 and 1964, the 622 code was added. In 1975, calls to offices starting with "4", "5', and "9" were being switched to the Auburn Avenue step office downtown. In 1977, this was changed and these calls were routed to the Downtown Crossbar Tandem. In 1981, these calls were being routed to the East Point ESS office. In 1982, the Step-by-Step equipment was replaced with No. 1A ESS. This was the last Step-by-Step office in the Atlanta Exchange but not the Atlanta Metro calling area. Around 1995, the No. 1A ESS equipment was replaced with No. 5 ESS equipment. The office opened in 1961, using No. 5 Crossbar equipment. The initial code was "366". The 361 code was added in 1963 and the 363 code was added in 1967. Forest Park was one of the last crossbar offices in the city. In February of 1986, a DMS-100 digital switching system began service. This may have been the first digital office in the Atlanta Exchange (not the Metro area). On May 4, 1958, the office opened using No. 5 Crossbar equipment with the name "Diamond-4". In 1960, the name was dropped and the code became 344. The 349 code was added in 1965. In 1966, Touch Tone was added. In the 1970s, the 346 code was added to provide <EM>DID</EM> service to Delta Airlines' offices at Greenbriar. It appears that Ben Hill may have been the last crossbar office in Atlanta. The crossbar equipment was still in service in 1986. Shortly after that, it was replaced. It was most likely replaced with DMS-100 equipment without first having ESS installed. As of 1997, the office is served by a DMS-100 machine. In 1884, a manual magneto switchboard began service here as The Decatur Exchange. This would have been in a different building. Calls to Atlanta were long distance and cost 15 cents for 5 minutes. Around 1895, Decatur became a part of the Atlanta Exchange making calls between Atlanta and Decatur local calls. The office was then known as the Decatur office in the Atlanta Exchange area. The magneto switchboard would have been replaced with a common battery board in the early 1900s and would have undergone a number of additions and improvements over the years. In 1923, when the first dial service began in downtown Atlanta, all area offices were given new names. This office's name became "DEarborn". In 1937, the office was converted to dial service using Step-by-Step equipment. The office name remained "DEarborn". Some time between 1938 and 1948, the office name "CRescent" was added, followed in 1949 with "EVergreen". In 1956, as a part of the city-wide conversion to 7-digit dialing, the offices were renamed. "DEarborn" became "DRake-3", "CRescent" became "DRake-7", and "EVergreen" became "DRake-8". n 1960, for a short time, office names were dropped, but the initial two letters were retained. This created codes "DR-3", "DR-7", and "DR-8". Shortly after that, the letters were dropped also and the codes were 373, 377 and 378. In the late 60s and early 70s, calls to extended area offices beginning with "4" and "9" were routed via the Decatur Crossbar Tandem across the street. Sometime between 1966 and 1968, the 371 prefix was added to provide <EM>DID</EM> service for the Dekalb County government offices. In 1969, Touch Tone converters were installed and Touch Tone service was offered to customers. The type of converters used here were the same as in Buckhead and based on the same equipment as the Chamblee common control step. There must have been very little growth in the area served by this office between 1957 and 1968. Most other offices in the city added several new prefixes during this time period. In September of 1980, the office was converted to 1A-ESS equipment. In November 2001, the equipment was replaced with No. 5 ESS. There were two different ringback tones associated with the East Lake Step-by-Step office in the later years. The tone plant changed some time in the mid 1970s. The older tone plant didn't go away completely. It apparently became the alternate (backup) plant and the old tones would return from time to time when they took the main machine out of service for maintenance. In 1957, the newspaper reported that this building was being constructed to house Long Distance operators. But the building ended up housing Information (Directory Assistance) operators. In September of 1964, the Decatur Crossbar Tandem began operation in this building. This was the second Crossbar Tandem in Atlanta. This one was used for local service only, relieving traffic on the Downtown Crossbar Tandem at 51 Ivy and the Auburn Avenue Step Tandem. The office was opened in 1956 using No. 5 Crossbar equipment opened as "Butler-9". In 1960, the code was "BU-9". In 1962, the 284 code was added. Numbers in the directory showed both two-letter codes and all-numeric codes. 284, BU-4, 289, and BU-9. In 1966, 288 was added. Around March of 1981, the office was converted to No. 1A ESS. In May of 2002, the 1A-ESS remained in service. The office address was originally Gresham Road when it opened in 1963. The equipment used was No. 5 Crossbar and the first code was "241". A few years later, the 243 code was added. The office was converted to No. 1A ESS at some time around 1980. In May of 2002, the 1A-ESS remains in service. 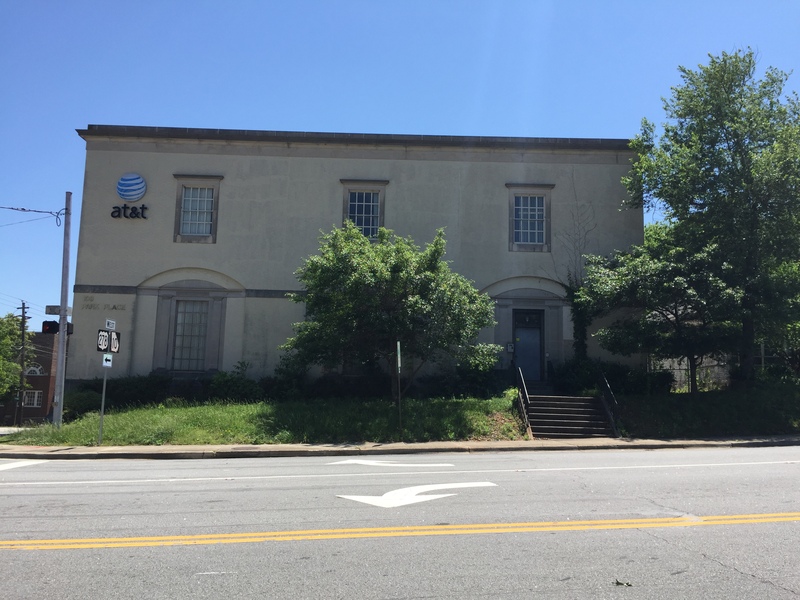 This office is included in the Intown Section because it was considered part of the Atlanta exchange area and not the "extended" metro calling area. This was strange considering its location in Clarkston. The original Clarkston office was considered an exchange of its own and not considered part of the Atlanta exchange. The office opened on November 24, 1970, using No. 1 ESS equipment. The initial code was "292". A portion of the customers previously served by Decatur 37X, Columbia Drive 28X, Clarkston 443, and Tucker 93X were cut over to this new office. All Clarkston 443 customers were absorbed into this new office and the Clarkston Office was closed. In the late 1970s, this office routed many extended area calls through the Decatur Crossbar Tandem. In 1973, this office took over the remaining territory previously belonging to the Clarkston office. Clarkton customers received new "296" numbers but kept their last 4 digits. Some time in 2000, the office was converted to No. 5 ESS. In 1922, the office was opened as a manual common battery switchboard. The building was not at the present day address but a few blocks away. The office name was "Belmont". In 1947, a new building was constructed at the present location to house Step-by-Step equipment. On October 12, the customers were switched to the new office. In 1955, during the city-wide conversion to 7-digit dialing, the office was renamed "SYcamore-4". This change was particularly problematic because people did not know how to spell Sycamore and flooded the operators with requests for assistance. In 1960, the name was dropped and the code became 794. The 799 code was added in 1963 and 792 in 1966. In 1973, a No. 1A ESS machine was installed and took over the 792 code. Around 1980, the rest of the step-by-step equipment was retired and customers were transferred to the ESS machine. In May, 2002, the 1A-ESS equipment remains in service. The office was opened in 1968 using No. 5 Crossbar equipment. The initial code was 691. In 1982, the crossbar equipment was replaced with No. 1A ESS.